Herb Kelleher, the former CEO of Southwest Airlines, a company that remains the “gold standard” case study for customer-centricity, was also unusual in that he was famous for behaving in ways that were “on brand”. Herb used to fly as often as he could on his own planes or, if he wasn’t traveling, he would meet passengers when they were boarding or leaving the planes. He would share a joke with them or a drink but always he would be asking them about their experience, which helped him to understand how to improve it. Southwest Airlines featured Herb in many of their ads: reinforcing their key messages, showing the connection of the leader to his customers and always with the company’s customary sense of humor. P&G’s purpose is to touch and improve more consumers’ lives with more P&G brands and products every day. Of all our stakeholders, both outside and inside, the primary one is the consumer. Everybody knows that the customer is king; we knew this in 2000 as we know it today. But we were not acting on what we knew. That had become apparent to me in 1998, when, as executive vice president, I returned from an assignment in Asia, where we didn’t have reams of research data on consumers and markets. In China, for instance, we had no choice but to visit consumers where they lived and observe them where they shopped. Coming home to our global headquarters, in Cincinnati, I was struck as I walked the office halls by how many employees were glued to their computers and how much of each day people spent mired in internal meetings with other P&Gers. We were losing touch with consumers. We were not out in the competitive pressure cooker that is the marketplace. Too often we were working on initiatives consumers did not want and incurring costs that consumers should not have to pay for. Everywhere I go, I try to hammer home the simple message that the consumer is boss. We must win the consumer value equation every day at two critical moments of truth: first, when the consumer chooses a P&G product over all the others in the store; and second, when the consumer or a family member uses the product and it delivers a delightful and memorable experience – or not. Almost every trip I take includes in-home or in-store consumer visits. Virtually every P&G office and innovation center has consumers working inside with employees. Our employees spend days living with lower-income consumers and working in neighborhood stores. At our global headquarters we replaced dozens of paintings by local artists with photographs of everyday consumers around the world buying and using P&G brands. All these efforts keep the two moments of truth foremost in the minds of P&Gers as they work. 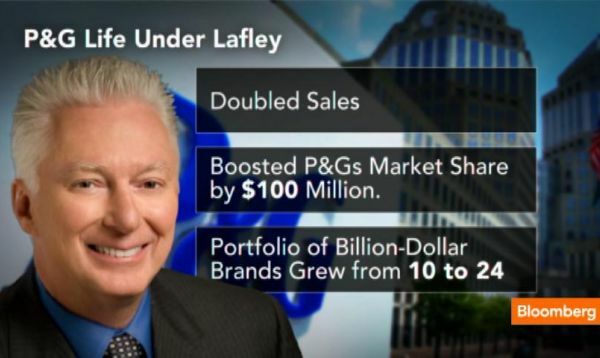 Lafley retired as CEO in 2010, having doubled P&G’s sales to over $100 billion during his time there. Unfortunately, his chosen successor, Robert McDonald, endured a difficult time. The company struggled to address changing consumer trends towards value rather than premium products in a post global financial crisis world. McDonald stood down as CEO in 2013 and Lafley returned to replace him. In one of his first internal memos to all employees, Lafley reminded them of where true leadership lay: “the consumer is boss”, he wrote. Lafley’s words illustrate the importance of a leader doing “small things people notice” such as replacing the office art with pictures of consumers, of visibly role-modeling behavior by visiting consumers himself. He insisted that in-home visits with consumers be arranged for him in whatever city he visited. Executives at P&G realized that if the CEO could make time to visit consumers in their homes, so should they. Excerpted in part from: On Purpose: Delivering A Branded Customer Experience People Love by Shaun Smith & Andy Milligan, in partnership with Kogan Page publishing. The Blake Project Can Help: Please email us for more about our purpose, mission, vision and values workshops.